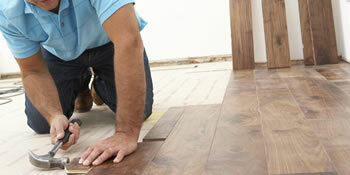 When decorating your rooms, one of the most important features is the flooring. This can make or break the finished look and there are a wide range of options for you to choose from, depending on the room that’s being renovated. Wood floor renovation doesn’t have to be expensive and you can easily find something that’s durable and hardwearing whilst being attractive on the eye too. What’s crucial to remember is that the flooring will radically change depending on the room you’re decorating. The qualities needed will vary, so for instance you’ll need a durable, water resistant material for the bathroom. However, you’d be more inclined to choose a comfortable, warm feel for the bedroom. This is often chosen when you want to create a warm feel, with a soft underfoot touch. Carpet fitting is a skilled trade and isn’t recommended for an amateur. There are thousands of colours and designs available to select from, depending on the room. Carpets tend to be utilised in bedrooms and living rooms. Laminate flooring has shot to popularity because of its ease of maintenance and cheap cost. It is manufactured to resemble wood and is easily fitted by slotting pieces into one another. Laminate flooring is often used for the kitchen and living room because it’s easy to clean, with a sweep or mop appropriate. Tile flooring has better durability and hardwearing qualities than laminate. It’s also extremely water resistant, making it a great purchase for kitchens and bathrooms. And the good news is it comes at a competitive price. As with everything you pay for the quality, but even the cheaper tiles range will last for years with no problems. Parquet flooring gives a sense of elegance to the room, with speculative designs. It’s made of wood pieces slotted together in a pattern of your choice. Parquet flooring is known for its hardwearing qualities and the elegance makes it suitable for dining rooms, hallways and bedrooms. If you’re interested in changing the flooring throughout your home or just in one room, it’s well worth receiving a number of quotes so you can compare prices and ensure to get the best deal. For up to four FREE quotes, just complete our quick form and you’ll hear from local, vetted and reputable floor fitters. These are all no obligation quotes so you have the ultimate choice. Project: Replace kitchen floor damaged by water leak. Replace chipboard and polythene layer. The house in question is in Trowse, Norwich and belongs to my friend.